The intestinal lining is a single cell layer that comprises the body’s largest and most important selectively permeable barrier. A heathy mucosa permits nutrient, electrolyte and water absorption into the bloodstream, while maintaining a defensive barrier against toxins and antigens. An inflamed, dysfunctional intestinal lining, sometimes called leaky gut, allows for undesirable metabolic and microbial toxins to enter the blood stream. These compounds wreak havoc with the immune system and result in attacks on the body’s own tissues. Leaky gut is believed to be a major contributing factor behind the development of inflammatory conditions, food allergies, autoimmune diseases, and inflammatory bowel diseases. A healthy functioning gut is better able to defend against intestinal permeability. The beneficial health effects of probiotics are numerous and well documented. Clinical evidence shows that in addition to keeping harmful gut-dwelling pathogens in check, probiotic therapy aids digestion, nutrient absorption, and elimination, while supporting immune functions, delaying the development of allergies in children, and helping to maintain women’s urogenital health. Prebiotics, non-digestible fibers that feed, strengthen and selectively stimulate the growth of certain bacteria in the colon, are beginning to receive the attention they deserve. Clinical nutrition studies over the last few decades have established the importance of prebiotics in promoting a healthy and balanced microflora. To be considered a prebiotic, a compound must reach the colon without alteration or degradation, and must stimulate the growth and proliferation of non-pathogenic bacteria that have heath promoting potential, such as Lactobacilli and Bifidobacteria. 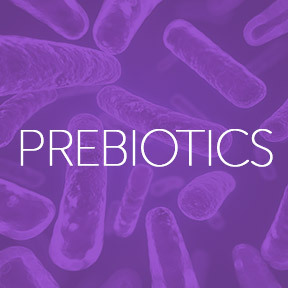 Prebiotics can include fructooligosaccharides, arabinose, galactose, inulin, mannose, glycooligosaccharides and other non-digestible, high fiber chemical compounds. Per scientific research, prebiotics are associated with reduced risks of certain diseases including osteoporosis, cardiovascular disease, obesity, type 2 diabetes, and colon cancer. In addition to supporting immune health and protecting the urogenital system, prebiotics support proper gastrointestinal function, help to eliminate cholesterol, aid the absorption and production of B complex vitamins, and decrease inflammation and autoimmune reactions. Foods and supplements that contain both probiotics and prebiotics are known as synbiotics, as they work together to support colon health and a healthy gut environment. The list of foods that provide natural prebiotic sources includes: some whole grains, under-ripe bananas, certain vegetables consumed raw such as dandelion greens, chicory root, jicama, garlic, asparagus, leeks, and Jerusalem artichoke, as well as honey, raw or cooked onions and acacia gum. Synbiotic sources that provide both probiotics and the fuel necessary for their survival can include fermented dairy, such as yogurt and kefir, as well as kombucha, kimchi and fermented vegetables. Along with a healthy varied whole food high fiber diet, prebiotics from food or supplement sources should be carefully balanced with probiotics, and consumed regularly to ensure the health of beneficial microbiota and encourage microbial diversity. Broad Spectrum Probiotic & Prebiotic by Prescript-Assist: This shelf stable, broad spectrum supplement provides a clinically tested proprietary blend of 29 separate highly resistant strains of beneficial bacteria along with a prebiotic food source. These species are inherently adapted for survival in the GI tract, ensuring colonization in the intestines and supporting optimal gut health and a normal balance of intestinal microflora. Gluten and dairy free, vegan formulation. HMF by Genestra: One serving provides 5 billion CFU’s (colony forming units) of human sourced Lactobacillus acidophilus and Bifidobacterium to assist in the maintenance of normal intestinal health and the integrity of the immune system. Gluten, soy and dairy free, vegan formulation. Actiflora+ Prebiotic and Probiotic by Kendy Nutraceuticals: This synbiotic formula provides 45 billion CFU of viable beneficial bacteria along with prebiotic inulin in support of optimal immune and digestive functions. Gluten free, vegetarian formulation. Vegan Probiotic with FOS by Deva Nutrition: This shelf stable vegan formula provides 2 billion CFU of stomach resistant, spore forming microflora per capsule along fructooligosaccharides (FOS), a well-known prebiotic found in garlic, leeks, artichokes and chicory root. Gluten, soy, dairy, yeast and sugar free. This entry was posted in Home and tagged Actiflora+ Prebiotic and Probiotic by Kendy Nutraceuticals, Broad Spectrum Probiotic & Prebiotic by Prescript-Assist, HMF by Genestra, Prebiotics, Vegan Probiotic with FOS by Deva Nutrition. Bookmark the permalink.